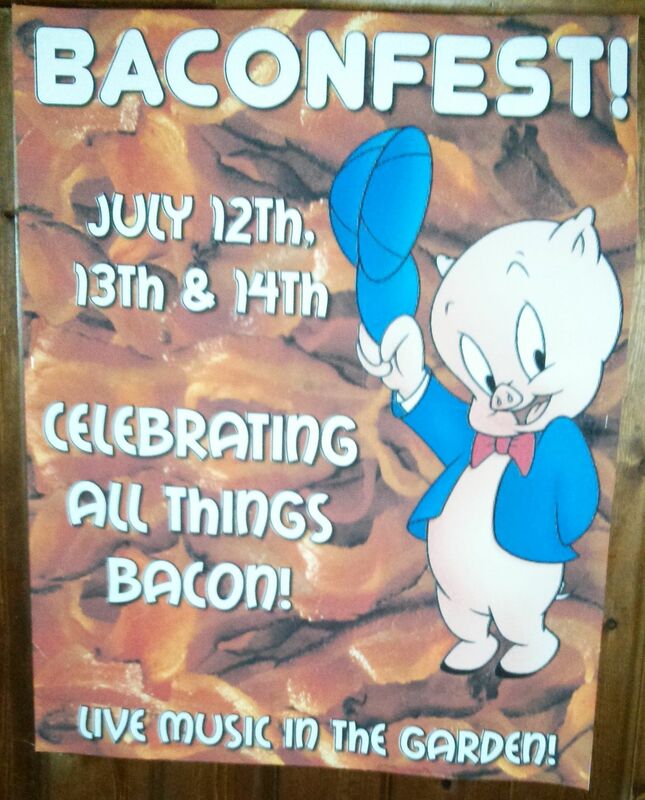 Sorry, you missed baconfest. But I went for you, so your cholesterol count is safe. Candied Applewood Smoked Bacon with Pecans. Bacon skewers with caramelized onion & bourbon dipping sauce. Steakhouse bacon, a grilled slab of pork belly. Bacon-wrapped shrimp. Bacon-wrapped hot dogs. Bacon Mac & Cheese. Bacon Meatloaf. BLTs. The Elvis Presley Bacon sandwich, peanut butter, bananas and bacon! Now pair this with a beer hall serving 144 taps (albeit maybe two dozen or so beers on those taps) and you have a night to remember. It was my friend Mike Dross’s pre-birthday, and the only thing he loves more than bacon is bacon. So we baconed him up. With a beer mug the size of an artillery shell in hand, we sailed the seas of bacon and enjoyed killing our hearts and livers at the same time. My favorites? 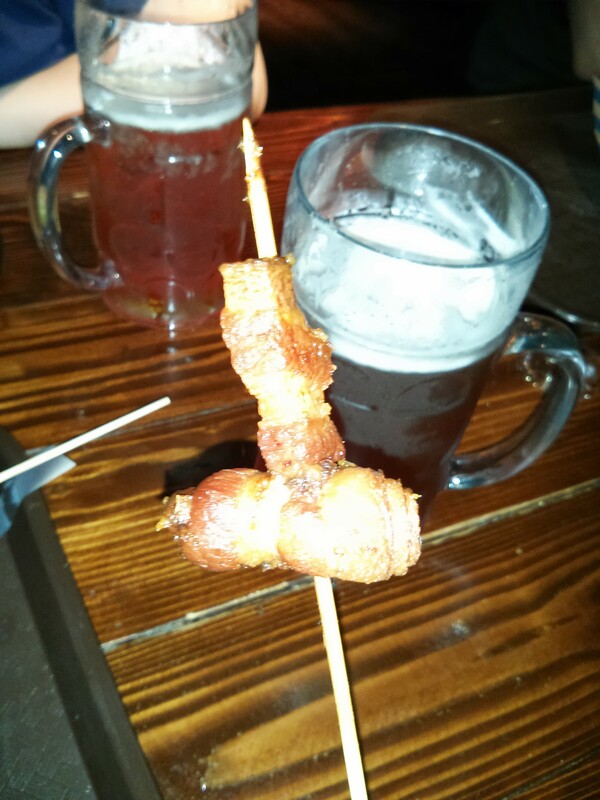 The chocolate covered bacon and the BLT, which was appropriately overladen with delicious, crisp bacon. The chocolate bacon was twirled around a skewer and then coated, with a cherry on top. They did a good job. Zeppelin Hall is no gastropub- they serve down-home German specialties like wienerschnitzel and authentic currywurst well, if a tad pricey, but they also serve the biggest beer in the region. They aren’t my #1 choice, but in Jersey City, they are a great choice for beer lovers, who want space to breathe and enjoy good food. They also have plenty of parking, something rare in the JC area. And they made a damn decent burger, a memorable one with a good sear and beefy flavor, solid bun, properly cooked to order. The Bacon-Bacon burger was good, if not quite the amazing Baconeator Burger served at Morris Tap & Grill. 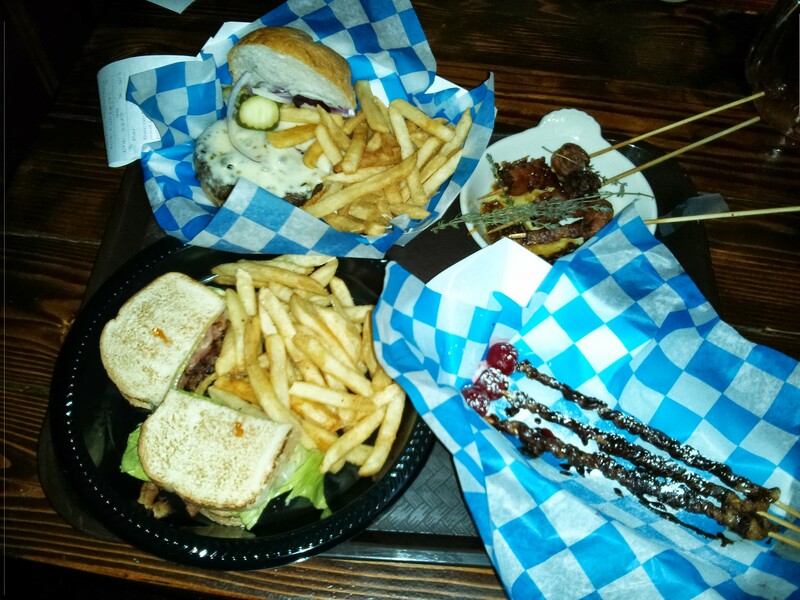 I could’ve eaten the bacon skewers all evening, but the Elvis was a sad sandwich, thin, with only a few strips of bacon that seemed like the thin, microwave variety, and barely a spread of peanut butter. I ordered it late, so maybe they’d run out of the great bacon I had on the skewers. So is there such a thing as too much bacon? Maybe there is. But there’s never too much beer. They serve Oktoberfest brews all year round from Hofbrau and Hacker-Pschorr, and I really enjoyed the Commodore Perry IPA from Great Lakes brewing as well. Great Lakes is becoming one of my favorite breweries.